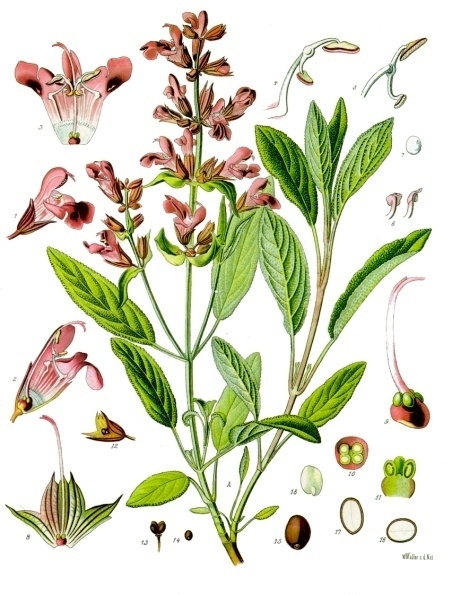 Sage is a herb from the Lamiacae family and the genus Salvia. 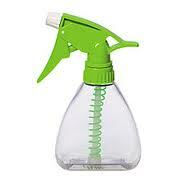 Its soft, furry leaves pack a powerful punch when it is steam distilled into an essential oil. I did touch on the herb oils in this earlier article “Essential Oils from Herbs are Spectacular!”, but they are so important in Aromatherapy I thought I must elaborate! Interestingly this is also the name we give to someone who is wise, shares wisdom and perhaps weaves some magic too. A sage would be someone we hold in great esteem and who holds the wisdom of the universe in their healing hands. So does the essential oil of sage also contain these properties within its molecules? Yes! Of course. I’ve always used sage as an oil of abundance and as the perfect treatment for a sore throat, sage encourages us to speak truthfully and wisely and opens the throat chakra. When we speak kindly and feel compassion we are able to feel the abundant intelligence of the universe move within us. Sage is one of the ancient herbs that has been used for healing for centuries and the Romans named it salvia after “salvare” meaning to heal. According to Patricia Davis the Latin name also indicates the word “salvation” as this plant was seen to save people from disease. 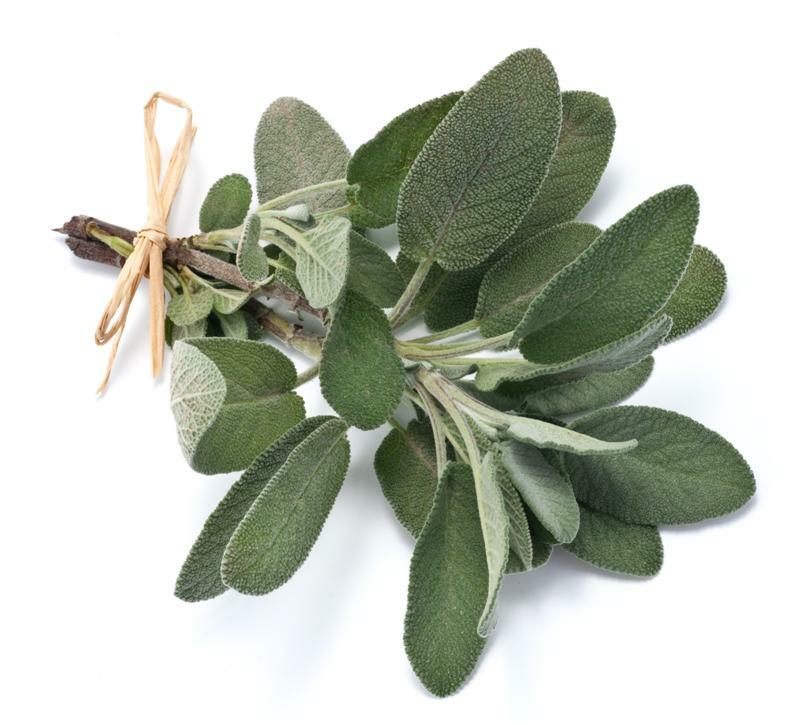 During the centuries since then, sage has mainly been used in women’s health to normalise menses and as a stimulant for childbirth. It is high in camphor and thujone – which has a few contra-indications including the warning not to be used in pregnancy or with epileptics, or kids. I use this oil sparingly and with great respect. Just because something is natural does not mean it is totally safe. Having said that please do your homework and use your intuition when using natural remedies. 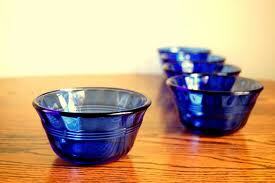 and sometimes to stimulate digestion and remove catarrh. 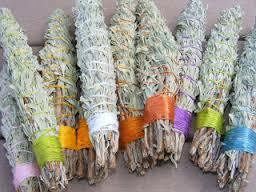 Sage also gives another form of healing in the way of “sage sticks”. They are used for smoking, purging and cleansing ceremonies but are usually made from white sage (Salvia apiana) which is mostly found in north America. It does feel fantastic when you smoke a premises to renew the energy of the space! This entry was posted in Essential Oil Profiles, Essential oil recipes, Essential OIls, Healing Herb Oils and tagged aromatherapy, aura cleansing mist, cardamom essential oil, clear your mind, consciousness, daily ritual, energetic space cleansing, essential oil recipes, essential oils, essential oils for abundance, essential oils for fluid retention, essential oils for labour and childbirth, essential oils for menopause, essential oils for new beginnings, geranium essential oil, lemon essential oil, lime essential oil, mandarin essential oil, natural scents, orange essential oil, peru balsam essential oil, pulse point perfume, sage essential oil, scent, space cleansing mist, space cleansing with essential oils, vanilla CO2 extract by suzannerbanks. Bookmark the permalink. Thanks James! In fact I wrote a book over a year ago and it’s still at the publisher waiting in line. I started the blog to create a platform for my book and now I’ve written so much more in my blog than I ever did in my book! Life! ps. I second James’ emotion! Would love to see all your writings in a book. Energetically, what is the difference between Mandarin and Orange? I have Orange, Blood Orange and Tangerine. I made a room mist for a friend who doesn’t much like fragrance. (She’s very into interior design.) She loved it. My first little bottle of Mandarin ariived today. It’s much different from the Oranges and Tangerines. It reminds of the taste of a Kumquat, orangey with a bitter-sour edge that is rather sophisticated. Marvelous! Going to start at the top and blend it with Cedarwood Virginia (one of my favorites) for a little communion and add a drop of Rose for love. Brilliant blends Jackie! Bon chance! Oo, sounds marvelous! (May have to order it; don’t think I’ve seen it in the shops.) I’m wearing a necklace of fired red agate these days that also corresponds with the lower three chakras: building strength and creativity.